It took me four years, but I finally figured it out. 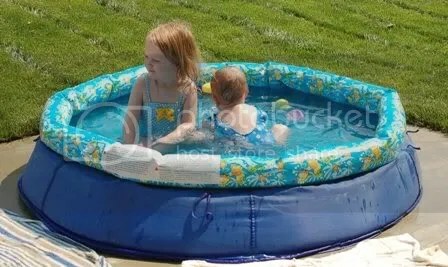 Every summer I buy the girls an inflatable kiddie pool. And every year within about 72 hours a dog has popped said inflatable kiddie pool. So I go out and buy another one. Seriously, am I this dense? Apparently so, But now I got it! I finally broke down and bought a hard plastic one from Wal*Mart. Yes, now I have the problem of storing the darn thing, but I don’t think Gracie Lou will destroy it. Yes, I assume at some point she will chew on it, but I think it will still work just fine even if she chews on it. In my defense one of my hesitations with getting one of these was the Little One’s ability to get in and out. She is finally tall enough to almost get in and out unscathed. She slipped a couple times but just said “WHOA! It’s sippery! !” and tried it again. 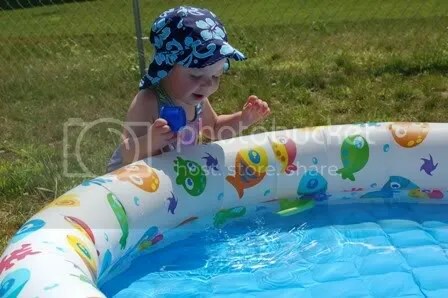 So today we a have a pictorial journey of my kiddie pool obsession. Summer of 2006 ~ the Big One’s first pool. A neighbor’s dog got this one when she was visiting. Summer of 2007 ~ I’m not sure if this one met its demise at the teeth/paws of my dog, my sister’s dog or grandma and grandpa’s dog. Summer of 2008 ~ I think this one was my favorite. 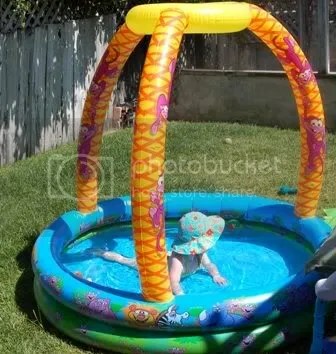 Only the top was inflatable. The rest was vinyl. This one is great! It folded up into a small circle thanks to the bendy-frame thing. Problem with this one was when the grass at grandma and grandpa’s house started growing through the bottom plastic liner. Then Gracie Lou got to the top. April of 2009~ This was our first one for this summer. Very cool and very fun. Gracie Lou thought so too! We have your “08 model” pool right now and I am holding my breath every time Ronan goes near it. Joe can’t fold it back into it’s case so he usually leaves that part up to me. I’m lobbying for an inground pool now. My grandpa could even do some hydro therapy if we had one ;)!! We also have the 08 model that folds into a carrying case and our dog havoc loves to get into it. Never puts his nails into it because he does a straight running jump into it lol! We have an inflatable above ground pool, so i have the feeling that we are just tempting fate here lol! I hope this one lasts! Stevie got one of those green turtle sandbox things for his first birthday and it has turned into the swimming pool. It has held up great for 3 years. I don’t even bother putting it away. Yep, it stays outside all year round. I just scrub it out with bleach every spring and it is ready to go. I hope yours lasts as long! Was it Sandy who got the 06 model pool? I know haw she loves inflatable things.